The 2019 General Election is just around the corner. There are three main outcomes that could occur once the results are out. While there are a number of permutations and combinations, the three key scenarios are – an NDA government led by the BJP, a UPA government led by the Congress or a ragtag motley coalition government of regional parties supported by the Congress. The reaction of the markets will also be quite different in these scenarios. In the first scenario, the markets will take the outcome favorably and given the high probability, the market has already rallied in support of this outcome. A Congress led government would be looked upon less favorably given the highly populist (and what some might say fiscally disastrous) policies that have been promised. The third scenario will be looked upon as an absolute disaster given that policy-making will go for an absolute toss as regional parties enact policies favoring their individual states. Now let us look at these three scenarios in detail and their possible impact on the financial sector. The current Modi led NDA government has done quite a bit to improve the business sentiment of the country as well as the overall image of India on a global stage. India has made a jump of 23 spots to rank 77th in the World Bank’s latest report on the ease of doing business, after a series of progressive reforms were passed by the government. India attracted USD 239 billion worth of foreign direct investment over the last five years. Liberalization of FDI policy has supported increased inflows into the country. The GST and insolvency reforms are also expected to pay dividends in the future. The current government also gave India a new digital identity. The Pradhan Mantri Jan Dhan Yojana launched by the government in August 2014 has increased financial inclusion in the country. As mobile phone penetration has increased in India, it is easier for financial institutions to reach out to remote locations in the country. The Modi government aims to grow India’s digital economy to $1 trillion by 2022. The government has been encouraging payments by using the BHIM-UPI platform. Most of the financial investors think that the BJP government is the best possible outcome and the stock market has rallied sharply after the Balakot strike which has greatly increased the chances of the BJP led NDA coalition. Things were looking bleak after the BJP losses in three major state elections but have now turned around as Amit Shah builds bridges with key coalitions partners such as the JDU and Shiv Sena. The Congress led UPA government will not be looked upon too favorably by the market and the financial sector. The Rahul Gandhi led Congress party has not announced any key reform in its manifesto except for more giveaways in the form of doles. There is no major business reform and no vision to move the country forward. Also, even if Congress comes to power, it will be heavily dependent on its allies for support. They will demand their pieces of flesh and a return to the corruption era of the UPA-II does not look far fetched. A lot of the problems facing the country today in the form of the bank NPA crisis can be traced to the UPA-II government during 2009-2014. There is also the danger that the country could again return to the high inflation rates of the past as Congress implements the UBI scheme of transferring INR 6,000 a month to the poorest 20% of the population. 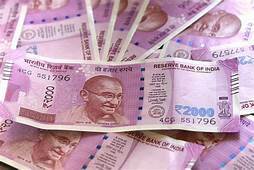 The third possible outcome which will be looked upon as a disastrous outcome by the markets would be a Third Front government coming to power. This ruling coalition would not be led by a single party but by a multitude of regional parties which would have nothing in common. They would just look after their own petty interests and the government would be highly unstable as it would be dependent on the support of a major party (most probably the Congress) from the outside. The key constituents would by SP, BSP, TMC, and others who would probably hold the key portfolios. Without any national vision, these regional parties would try to make hay as long as the government lasts (which going by the past experience would not be too long). Policy making would suffer greatly and governance would be in short supply. The experience of the Third Front governments in the 1990s was quite bad and the financial sector would suffer like the rest of the economy. The INR might tank as foreign investors run for the hills and the impact on debt and equity markets could be quite bad. A Modi led government has been characterized by strong structural reforms so far. The IMF has attributed India’s strong growth to policies passed under PM Modi which is more fiscally prudent. The country is making rapid progress on the global economic ladder and the government has managed to rein in both inflation and fiscal deficit. It remains to be seen what happens in the future. Let’s hope for the best and prepare for the worst – is all that I can say!